Are there differences between Men and Women with Parkinson’s? At 10:00 pm, the husband looks at his wife and says “it’s time to go upstairs to bed.” And he goes upstairs and gets in bed. 45 minutes later, his wife finally comes upstairs. He asked her what took her so long. Her response: I had to clean the kitchen, put the dirty clothes in the laundry, walk the dog, make sure all the doors and windows were closed, check on the kids and on and on…….. Yes, there are definitely differences in Men and Women. Women have historically been nurturers and caregivers. They take care of their children, their spouses, their homes. And many of them are still working. When diagnosed with a disease like PD, their entire support system is turned upside down. It can be difficult to let someone else be THEIR care-giver. 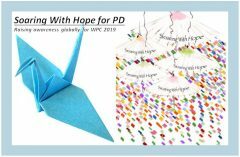 In the last few months, as co-lead for the Parkinson’s Foundation’s Women and PD TALK , I have been talking to Women with Parkinson’s about issues facing them as women with a chronic illness. As mothers, and as lifelong caregivers, many women have never even thought to ask for help when they need it. It often takes longer for women to receive the diagnosis of Parkinson’s Disease than it does for men. Many are told that it is in their head. They are often told that they are depressed, especially if they are younger. Most women go to their doctors alone. Many have shared that they go to therapy, alone. They often go to support groups alone. One woman said that she stopped going to mixed support groups because most of the women who came were care-partners and assumed that she was, too. She felt that she could not get the support she needed from a mixed group. Many women with Parkinson’s seek out support systems that include other women with PD. After all, who else would understand what they are feeling? They need the camaraderie and friendship that Women-only groups can provide. One thing I noticed last year when I attended the World Parkinson Congress in Portland, was that the overwhelming majority of the men with Parkinson’s were accompanied by their wives. The number of spouses who accompanied their wives who have Parkinson’s was far fewer. The interesting thing is that most men fare much better than women as the disease progresses. Is this because they have someone that will take care of them and advocate for them, even if they don’t ask for help? Many of the women with PD that I spoke to are now care-partners for their husbands, which means that they are not getting the support they need at home. This is unfortunate, because being a care-partner can take much more energy than these women with PD have to give. And they suffer because of it. Unless they can get help in their home, they often do not have the time to exercise daily and take care of their other needs. I am sure that the stress of being a care-partner must take its toll as well. Women who live alone have their own difficulties in accessing adequate care. What is the solution for these women with Parkinson’s? Are there differences in treatment? Care? Are their symptoms different than men’s? Why does is take longer for women to get diagnosed? We will be exploring these issues and more at the Parkinson’s Foundation’s Women and PD TALK forums that will be taking place in 10 communities around the country in the next 6 months. Stay posted for more information. Almost eight years ago, I was diagnosed with Parkinson’s and Breast Cancer in the same week. Obviously, it was a week when I wished I had just stayed in bed and hid under the covers. How do you react to the news that you have not one, but two major health issues that will be with you the rest of your life? Much of the next six months remains a blur to me. I underwent a lumpectomy and radiation for the breast cancer. A neurologist put me on ever increasing doses of Requip, and my estrogen patch was taken away from me. All of this meant that I slept all day, was plagued by hot flashes all night and pretty much walked around in a fog all of the time. Somehow I was able to come to terms with having breast cancer immediately. My mother had it, my sister had it. It is the disease that most women fear most. And it is the disease that is talked about everywhere. October is Breast Cancer month and there are a lot of stores that celebrate by producing Pink Products, or should I say Pink Profits? It doesn’t matter how useless the Pink Products are, we buy them anyway because it makes us feel like we are doing something positive. Celebrities talk with pride about recovering from breast cancer. There are rallies and walks to raise money. I even corralled my friends to walk with me as a team for the Revlon Breast Cancer Walk that first year. We wore our Pink boas with pride as we finished our 5K walk and entered the field at the Los Angeles Coliseum where the Olympics were held. We were Champions in Pink! Breast Cancer is fashionable. Is this really typical? Do we all look like this? that diagnosis. I wasn’t that old (57), I wasn’t a man, I didn’t shuffle, and I didn’t know anyone else with PD in my family or circle of friends. It was something my friend’s parents had, but they were much older and didn’t move very well. There were no Parkinson’s products for sale in the department stores during Parkinson’s Awareness Month. I didn’t even know there was a Parkinson’s Awareness month until this year. Parkinson’s events were not well publicized. After all, who wants to go to an event where everyone is shaking, drooling and shuffling? Parkinson’s is definitely not fashionable. I was active, playing tennis, going to yoga, traveling and enjoying life as much as possible. I didn’t have time for a chronic degenerative disease. I just had a tremor, so I tried to hide it. And I kept trying, but after a while, people started to notice. I thought that if I didn’t say anything, it didn’t exist. So I did what my friends and I call the “Parkie hand-hiding strategy”. You know the one where you hold your shaking hand, sit on it, stick it into a pocket or purse, or do some other strange maneuvers just to prove that it isn’t shaking. But of course, that didn’t work and I was only fooling myself. So why couldn’t I admit it to myself? Why couldn’t I tell others? It took a lot of therapy and writing my personal narrative for me to confront what I called the “Elephant in the room”. Once I started to write my narrative*, which only my therapist was privileged to read, things started to change. I started to write about life with PD. But only for other Parkies. The rest of the world still didn’t need to know. And then one day, I made a mistake. I posted something meant for my Twitchy Woman Facebook page on my public Facebook page. And the world didn’t come to an end. Wow! I was outed. And it was okay. So now I have embraced my PD. There is a wonderful world of people in the Parkinson’s community that I have met. The time I spent last month in Portland at the World Parkinson Congress was an eye opener. I was able to meet some people who I have corresponded with through this blog. I talked to doctors, therapists and researchers who valued my opinion. I spent time with new friends and old friends, looking for answers and camaraderie. We have a common bond and we understand each other. And we don’t all shake, drool or shuffle. In fact, we spent a lot of time working to dispel that image. We all have the Elephant in the room, reminding us that life is not the “normal” that it used to be. But that elephant is getting smaller and smaller, and one of these days, hopefully very soon, it will be banished from our lives. *More on the importance of writing your narrative in a future post. One of the most important thing that we, as People with Parkinson’s can do, is to take part in clinical trials. There are many trials that have very specific criteria for participants. And often, these trials do not get enough people to participate in order to complete the study because they are so specific. But there is one trial that anyone who is reading this blog can participate in. The study is being conducted by Laurie K Mischley, ND, PhD, MPH, at the Bastyr University Research Institute and is titled Complementary & Alternative (CAM) Therapies in Parkinson’s Disease. You do not need to leave your home. You do not have to meet with a doctor, take medications or any kind of tests. All you need is a computer with on-line access, an email address and basic computer literacy. You do not need to use CAM therapies to participate. “Positive Deviance is based on the observation that in every community there are certain individuals or groups (the positive deviants), whose uncommon but successful behaviors or strategies enable them to find better solutions to a problem than their peers. These individuals or groups have access to exactly the same resources and face the same challenges and obstacles as their peers. I have been involved in this study for about 2 years, so it was a pleasure to meet Dr. Mischley to talk about what she is doing. She told me that so many studies look at what happens before a person is diagnosed with PD. Her study seeks to look at PwP’s from diagnosis forward to see why some people do better than others. Every six months I get an email from Dr. Mischley with 2 questionaires to complete. It does not take more than 90 minutes to complete. If you are interested in participating or would like more information, go to the website at http://www.CAMCarePD.bastyr.edu. The World Parkinson Congress was much more than just a convention. It was an opportunity to meet and mingle with a diverse group of people who all have the same mission: finding a cure for Parkinson’s. There were so many options for all of us. We could go to medical research sessions, even if they were geared towards reseachers. Doctors came to exercise sessions with People with Parkinson’s (PwP’s). Sessions were labeled by how technical they were, but they were open to everyone. The exhibit hall had a huge variety of vendors, ranging from Parkinson’s organizations, to drug companies, speech therapists, a boxing ring and even one vendor touting a mattress to cure all ills. There were hundreds of posters, a staple at medical meetings, which outline the latest research and studies from around the world. Some were by researchers. Some were by PwP’s. Themed tours of the posters were offered for the curious. So where am I a week later? Still trying to digest all that I saw and heard. Fortunately, the WPC app has links to the speakers and their slide presentations. This is very helpful if you can’t quite remember the details, or missed a session that you wanted to attend. The key thing is that now, thanks to the program guide which has info on every session and every speaker, I know where to go for more information on so many topics relating to PD. PD is a Designer Disease. The symptoms and progression for each PwP is different. Doctors are now looking at other ways to alleviate symptoms, including alternative medicine, exercise and nutrition. As we learn more about our genes and PD, the challenge will be how to move forward with that information to get the best treatment possible. We were inspired by so many: Tom Isaacs, Brian Grant, David Leventhal and Julie Carter just to name a few. They have all made our lives better in some way. And of course, who was not brought to tears by May May Ali,when she recited her poem “Pearl”, in memory of her father Muhammed Ali. Finally, we were inspired by so many People with Parkinson’s who made the journey to be together in Portland. None of us is alone on this journey with Parkinson’s. There is support for us in so many ways. Doctors and other health care professionals, therapists, trainers, caregivers, friends with PD, are all there to help. I met people that I had corresponded with through this blog, finally putting names and faces together. And I met people I had read about, all of whom were eager to share their wisdom and their help. This is a global community. There were people from many different countries, including PwPs, Caregivers, Doctors and Researchers who are all working together to find a cure and make life better for PwP’s. Meeting authors and hearing about their books. Jon Palferman, one of my favorites, spoke about Brain Storms: The Race to Unlock the Mysteries of Parkinson’s Disease , one of the best PD books I have read. Alice Lazzarini talked about her transition from cutting edge PD researcher to Person with Parkinson’s in her book Both Sides Now: A Journey From Researcher to Patient . I am looking forward to reading that next. We must advocate for ourselves to get the best care that we can. Everyone I met has a story about misdiagnosis, wrong medications and bad doctors. We, as People with Parkinson’s do have a voice, and even if it is a soft voice, we can and should be heard.